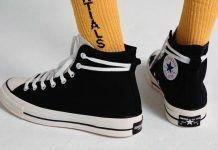 Converse releases it’s iconic Chuck Taylor in a trendy and bold big logo print. 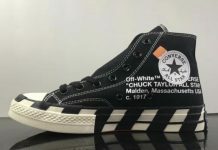 This Converse Chuck Taylor features an all-natural canvas upper highlighted with Red “CONVERSE” branding wrapping the lateral, heel and medial sides of the shoe. Tonal laces, Off-White rubber soles and Dark Brown outsole complete the shoe. The Converse Chuck Taylor Big Logo iteration is now available at select retailers like Sneak Avenue.